Smartphones may not be the best platform for reading through "Anna Karenina" or "Infinite Jest," but that doesn't mean books can't be designed with handheld devices in mind — and that's just what a new project from Google Australia called Editions At Play aims to do. "The pages in Editions at Play books can change like the weather, or have words that disappear or transform," said Anna Gerber, from project collaborator Visual Editions. 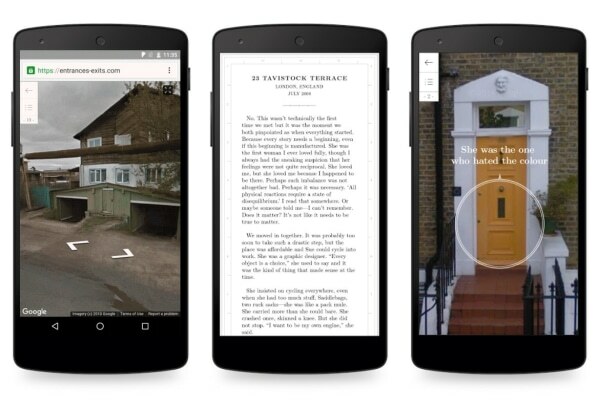 The books incorporate "unprintable" features, such as allowing readers explore locations in Street View, or switching between two characters' perspectives on a single event, or presenting information in the form of a game or interactive digital objects. Four books were commissioned for the project, each exploring the possibilities of this new digital format. "Enhanced e-books" have existed for a while, but these take things to a new extreme. Don't worry that Google is trying to replace regular books, though. "The Editions At Play team is aware its approach may ruffle a few feathers," read part of a presentation showing off the technology. "We are not out to challenge conventional publishing. We just want to open some doors to new ways of reading and writing literature that may fit better with 21st century sensibilities." You can buy the experimental books here — be sure to try before you buy to make sure the format plays well with your mobile device.